Harlem Globetrotter Orlando El Gato Melendez in action on the courts. NASHVILLE, TN — It’s that time of year. Once again, the world famous Harlem Globetrotters are coming to Music City this Saturday at Bridgestone Arena, to face off against their long-time adversaries, the Washington Generals, when they bring their one-of-a-kind 2018 “Amazing Feats of Basketball” World Tour. 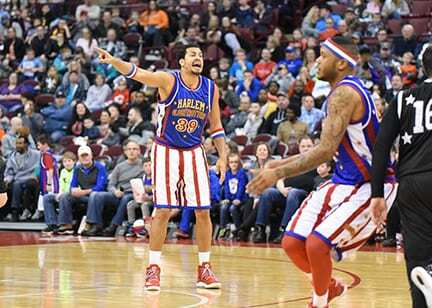 The Globetrotters will go up against a revamped, tournament-tested Washington Generals team—who are looking to snap a 47-year losing streak against their world-famous rivals. There will be two shows – 2pm and 7pm. The team has had an epic year using their incredible long-distance shooting skills to set a new Guinness World Records title, for the most half court shots made by a team in one hour. The team also established a new title for the highest upwards basketball shot-as part of the 13th annual Guinness World Records Day, when Globetrotter star Thunder Law made a shot from 50 feet, 1 inch. Incredible! But before Saturday’s big game Globetrotters El Gato Melendez and Swish Young arrived in town earlier this week. They paid a visit to the Nashville Christian school to have fun with the students and teachers. In addition to the on-court action, the Globetrotters, known worldwide as the Ambassadors of Goodwill™, are continuing to give back in communities around the country through The Great Assist initiative, which launched in October of 2015 and pledges to 100 million smiles around the world with acts of kindness. El Gato is originally from Puerto Rico, where he still resides. The catastrophic devastation from Hurricane Maria affected him and his family like so many others on the beautiful island. “Yes, it was pretty bad. But things are getting a little better. It was a little slow but we’re doing better,” he shares. So, Nashville get ready. El Gato says he and his teammates are bringing a lot of fun and laughter, some new dunks and tricks, plenty of comedy and their trademark interaction with their fans.